COACHES: Please share with your age 15-18 athletes on the lists below who wish to compete in the Carolina Crown Swim Challenge. The same information can be found on the NCS & SC websites. Keep in mind the application deadline is April 3! 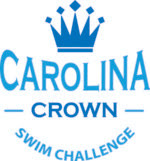 If your name is on the following list of automatic qualifiers or consideration qualifiers, you are invited to complete the APPLICATION FORM at the link below to participate in the 2019 Carolina Crown Swim Challenge. This LONG COURSE meet will be held at the Mecklenburg Aquatic Center on Saturday afternoon, April 27, 2019. The meet will include top athletes from both North Carolina and South Carolina. Please make out the check for $80 to “ North Carolina Swimming ” and mail to: Carolina Crown Challenge, 6766 Chauncey Drive, Raleigh, NC 27615. Please identify the athlete that the check is for. Only the checks of athletes selected to the final Carolina Crown roster will be cashed. The meet fee also entitles participating athletes to attend the Carolina Swimposium on Saturday morning at the Fairfield Inn, three blocks from the pool.